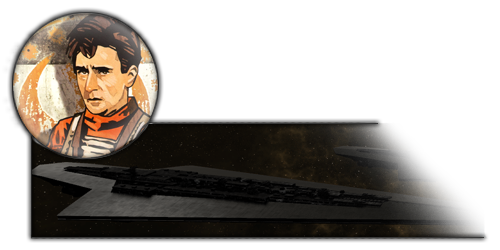 In this update, we talk about changes to one of the core features of Imperial Civil War, the era system. As usual, I have recorded a video version of the update for those who prefer that over reading. 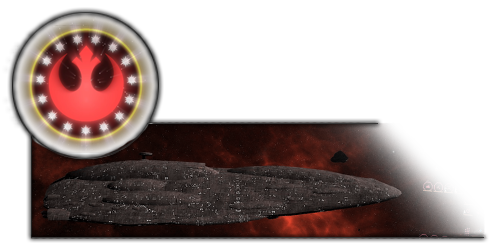 For those unfamiliar with the previous versions of the mod, the era system was the system by which tech is determined in Imperial Civil War. There were 5 distinct eras, each with different rosters for the factions based on what the time period was- these were the Isard era, Thrawn era, Palpatine era, Daala era and Pellaeon era, and players would progress through the eras by killing the Imperial leader. The purpose of the system was to tie story and tech into each other. While this goal was accomplished to some extent, there were a few major issues this presented. First and foremost, while the Empire of the Hand and New Republic would always benefit from an era change, Imperial players were often unaware that while the number was getting higher, they did not necessarily benefit from era changes in the same way- it's not a direct tech system, so higher isn't always better. Secondly, while it was meant to be a narrative system, and it certainly added some depth for those who were familiar with the lore, it was not especially intuitive to players who were less familiar with this period in Star Wars. Finally for those Imperials who understood the limitations but still wanted to get to other eras, the only method available to them was to to try sacrifice their heroes directly. In 2.2, we're attempting to solve or at least mitigate all of these issues. We're adding a bit more depth and variation to era changes and the method by which they occur, adding more story to their occurrence, and even changing some of the circumstances for how they occur. In this post, we'll go over the new eras and changes, and how they can occur. Some of you may remember that one of the first changes we announced for 2.2, before it took on the scope it has, was a "regicide" feature, where you can purchase an upgrade and it will progress to the next era as if the leader had died. We ultimately decided that this could be expanded a lot more to work better into the story. Each era now has three ways they can progress, generally- voluntary, involuntary, and timed. 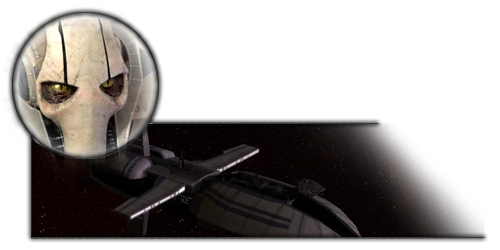 The timed events basically occur with events that were happening independent of factional choices within the lore, and put some pressure on the Imperial player to take advantage of their power points when they can, and also help keep the game progressing when not playing as the Remnant, but the timer tends to be quite long (it's unlikely to make it to era 5 through timers alone, except in the most drawn out campaigns). Generally, there is some advantage to being proactive with era changes over losing the hero or the timed events. These can all have different effects, depending on the leader, the map and the era. There tends to be more events within the eras, and we plan to expand on this in future versions as well, but this should give an idea of where we're going. Ingame, there will be holocron entry and leader speech events to help provide more background for each event. Voluntary Progression: Isard proposes your help in Project Ambition, deposing Sate Pestage. This grants the Lusankya, along with extra heroes (ie Grand Admirals Makati and Takel, Ait Convarion). Involuntary Progression: Either Sate Pestage is killed, or Coruscant is taken. Isard still takes over on Lusankya but with a smaller hero roster. Timed: 60 weeks in, Isard completes Project Ambition on her own and takes over, but without extra heroes. 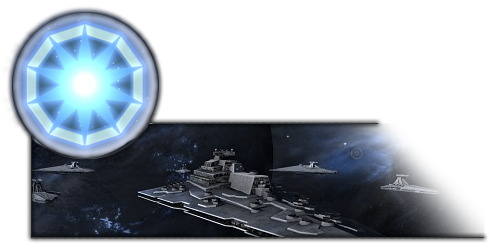 Voluntary Progression: Grand Admiral Thrawn offers his services, can be directly recruited. Involuntary Progression: Lusankya is destroyed in battle. Timed: 100 weeks after Isard takes over, Thrawn will complete his preparations and return to lead the fleet. Isard flees the Empire. 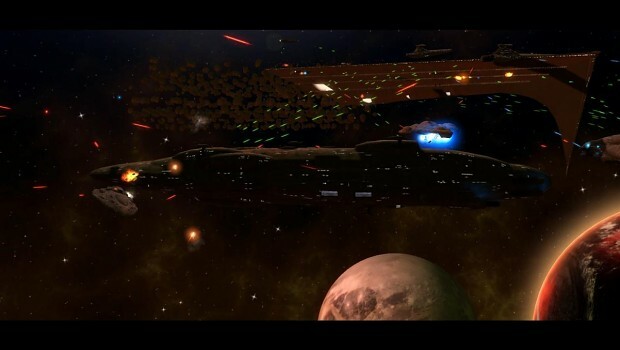 Voluntary Progression: Emperor Palpatine informs you of the massed Imperial fleets at Byss, orders resources to complete the Dark Empire forces. You enter era 3 directly. Involuntary Progression: Thrawn dies in battle, and the Ciutric Hegemony splits off if under Imperial control. Era 3 still requires the Dark Empire upgrade to complete, or the timer. Timed: 100 weeks after Thrawn takes over, Rukh assassinates Thrawn, with the same effects as Thrawn's death in combat. Voluntary Progression: Carnor Jax informs you he's been poisoning the Emperor's clones, contributing to their degeneration. If you choose to help him, once Palpatine dies no Imperial territory will rebel. Timed: 100 weeks after Era 3 begins, Jax's assassination attempts are successful. Jax takes over, and several Imperial planets potentially split off to join Warlord factions. Voluntary Progression: Admiral Daala asks for your allegiance in her attempt to reunite Imperial forces. Imperial heroes from previous eras will remain if you join voluntarily. Involuntary Progression: Carnor is killed in battle. Control switches to Daala, and all pre-existing Imperial heroes are removed. Timed: Kir Kanos kills Carnor Jax. 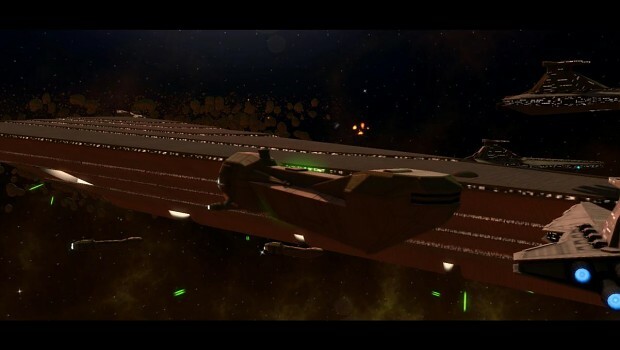 Daala emerges from the Maw and begins her campaigns against the New Republic. All previous Imperial heroes are removed. Voluntary Progression: Daala decides she is not the correct commander for the Empire, offers her resignation in favour of Pellaeon. Will return in era 5 with other Replacement Warlord forces. Involuntary Progression: Daala dies in battle. Does not return as an era 5 hero. Timed: 100 weeks after Daala takes over, she resigns. Pellaeon takes over. That's gonna do it for today. There are other era-based or time-based events in the mod, but this covers the actual method of progression. We're closing in very quickly on the beta phase, and so far we think we should be able to hit our target release date of March 28th for 2.2. Keep in mind though, it's still just an estimate. i like it. very nicely thought out. and yeah, no, unless your in for a 500 week campaign, you won't get the full time. i assume that the tech options for NR/EoTH won't be available till the leader dies/is removed, but while they have to research the units the heroes appear automatically? Good idea with time events, no more Palpatine and his OP superlaser forever if you play with Empire. Now we have "7" eras. Is it theoretically possible add more eras in furure or there is any limit for numbers of eras? What ship will have Carnor Jax or he is just ground hero? Will be Kir Kanos in mod? Maybe not in 2.2 but possibly in 2.3 could their be a way to extend how long we access to a certain Era by Idk. I like the timer because it makes it easier to deal with Palps, but it sort of raises the problem of where if Your Palps and control half the galaxy and then the timer is up you lose territory to Imperial Warlords. Does Dalaa start with the Gorgon or the Knighthammer? Does Carnor Jax have a flagship? "The Empire did nothing wrong obviously"
"Your Memes will make a fine addition to my collection"
The limit is still five proper eras because that's dependent on the tech level mechanic in the core game, the rest we're fudging via story events (hence it being era 1 part 1/2 and era 3 part 1/2). why do u hate america? if it were not for us u guys would be lost. i mean we invented the tv, we invented the internet, cars and we even went to the planet moon. we won all the wars and we always help the little countries who cant fight and we give food to poor people. This system looks fantastic. Nicely integrates game mechanics into the lore. Never really liked the tech level system; this overhaul is very important. I like that we are given the choice, but the timed feature seems to be stressful when you play as IR. You have to go after certain decisions to realize the full potential of the hero, i.e. getting SSDs out of a picture as Palpatine etc., on the other hand it could make the play more dynamic. I'm also not sure about the timers. Might feel a bit strange sometimes, especially if you end up counting weeks to be keep track. Glad you like it, but one thing must be noted here. We don't integrate the game into the lore. First and foremost we want to make a game that is as balanced and fun to play as possible, and then try to get as much of the lore in it as possible. 60 weeks is hardly what I would call stressful. It is a lot of time, during which once can confortably build up their forces. Not to mention that most GCs don'4 usually take 280 weeks, which is the time that once can reach Era 3 Part 2, so basicly about midgame. I believe it will be more common for IR players to switch as they crammed out as much of their leader as they could and want to move onto the next one to milk it dry as well. There also stated "Flagship 1" and "Flagship 2", are we to choose one? P.S. Don't have time to watch video in case it was elaborated there. The original system was already great but for sure less pleasant to play as IR, but with that one... that will be awesome ! This almost feels like Crusader Kings! Regarding the Tsoss Beacon event... cut-scenes are of course impossible, but might the loss of heroes be explained by the picture from the Essential Guide to Warfare showing them being gassed, with text underneath describing that? Just thinking about the way the Total War series used to explain an event with a picture and some text. NR tech works similarly to how it always has, however instead of unlocking all the units automatically some do require research. As Slornie says, we're technically limited to 5 tech levels, but with some story and lua stuff, we can expand that as much as we want. There was some discussion as to whether we should call Pestage and Carnor separate eras directly and devising a new display method, but since they're more tied into their counterparts in their eras, they've been left. Methods to extend the eras are being explored for 2.3, but wouldn't be something we'd be able to do in 2.2. As I touched on a bit in the news post, the 2.2 events are a starting point, from which we can more easily start branching out and expanding them in future versions, now that the basis is there. Daala starts with the Gorgon, Knight Hammer will be event based. With how it's planned to be handled, sometimes you'd be able to get it almost immediately, other times it would be more of a process. Carnor is ground only. His flagship, Emperor's Revenge, has been left in command of Redd Wessel (ala Sysco and Jerec, but you don't need to buy it). I like that we are given the choice, but the timed feature seems to be stressful when you play as IR. For some perspective, the timer is 100 weeks and eras 1 and 3 last 200 weeks overall. Assuming all progression happened by timed events, you'd have to reach week 600 for Pellaeon to occur that way. I just completed Art of War in my playthrough as the PA in about 460 weeks. For most people, I don't know how often they'd even be encountering this unless they absolutely never use their leader units. I did play a fair bit of EUIV during 2.2, and that's certainly helped with framing some of the story-related stuff. This looks like a very good change. I look forward to seeing it in action. I think it is well thought out, and gives the players some options on what they would like to do. The only suggestion I'd have would be to allow players to keep their current era if they choose, as others have suggested. I'm glad you're considering doing this for 2.3. But, this is definitely a great start! Very few people will ever even get to the point where the timed events even effect them. For some perspective, you are spending 100-200 weeks in each era with it. You wouldn't even be out of era 3 by time time I finished my PA playthrough. More importantly, the option to perpetually stay in a given era was never a thing except for the Remnant, so why should the one faction that benefits from it most have all the power over when the game advances? If you're playing the Remnant and you're in a progressive era GC, there should be at least *some* impetus to take advantage of your power spikes while you can. We will likely eventually put in events that can be done to stop the timed events, but it will come at a cost to the Remnant. That's what I was hoping for. The player shouldn't be able to stay in an era at zero cost to themselves. I probably won't end up staying in the same era perpetually if I play as the Remnant, but I'm guessing there'd be some players that would like to.